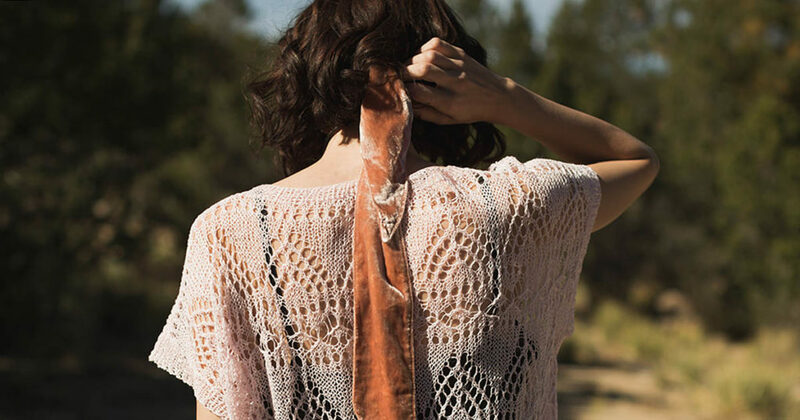 Take it from a former desert-dweller: it’s possible to don comfy knitwear in the desert heat. Just combine lightweight flax fiber, an airy lace pattern, a light color to reflect the sun, and a breathable gauge . . . you’ll have it made in the shade! Don’t forget to put on lots of sunscreen, though: lace-shaped tan lines may be stylish in your imagination, but they’re uncomfortable in real life. 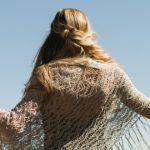 The Arizona Tee, found in Interweave Knits Summer 2018, is an oversized, versatile, lightweight summer top with lots of ease and drape. You can layer it over a tank and shorts, a sundress, or just your swimsuit. Those bands of geometric lace are ever-so-flattering, breaking up the long lines of this design and drawing the eye up to the face, framed by a scoop neckline. Combine with a long necklace as modeled in the magazine and you’re ready to hit an art walk, turn heads at a farmers market, or soak up some rays at the pool. The straightforward construction and simple shaping allows you to focus on the elegant lacework as you knit. The lace is knit back and forth, with lots of rest rows that will help you move through the pattern quickly. After blocking the two pieces, seam them together by joining the bands of lace patterning, add ribbed neckhole and armhole edging, and get ready to bask in the sun and admiration. FINISHED SIZE 41½ (48½, 55, 62, 68½)” bust circumference. Tee shown measures 48½”; modeled with 18½” of positive ease. YARN Fibra Natura Flax Lace (100% linen; 547 yd [500 m]/3½ oz [100 g]): #102 pale blush, 2 (2, 3, 3, 4) skeins. Yarn distributed by Universal Yarn. NEEDLES Size 3 (3.25 mm): 16″ circular (cir). Size 4 (3.5 mm): straight. Adjust needle size if necessary to obtain the correct gauge. NOTIONS Marker (m); removable m; stitch holder; tapestry needle. GAUGE 19 sts and 27 rows = 4″ in lace patt on larger needles. The Arizona Tee is only a start to your summer knitting adventure.